A monthly post to (hopefully) inspire you to look at old things in a new way. 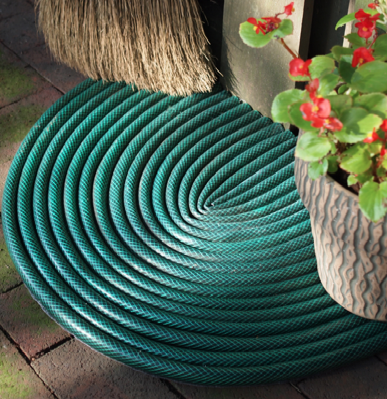 All gardeners have them, they are a necessity in every garden, but what do you do with your hose when it is no longer usable. 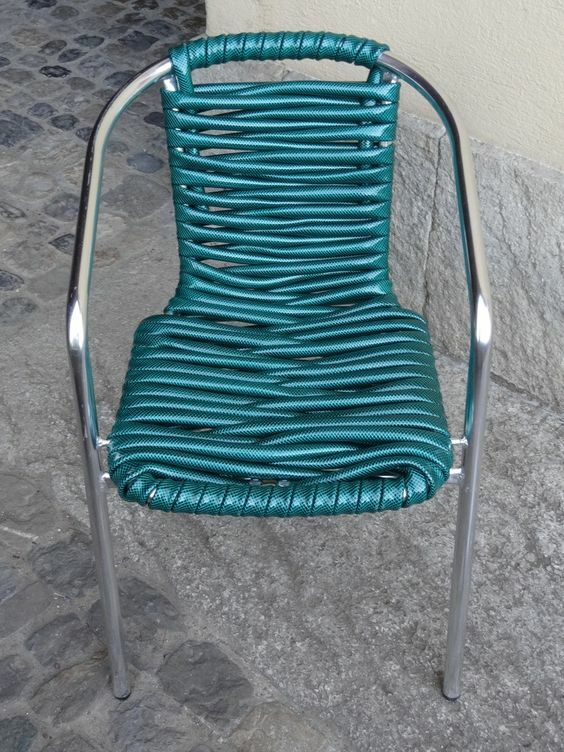 Below are a few ideas to help keep that old hose out of landfill and turn it into something useful or decorative around the garden. Mark from Mark Kintzel Design turned his old hose into a door mat after the garbage collectors refused to take it. 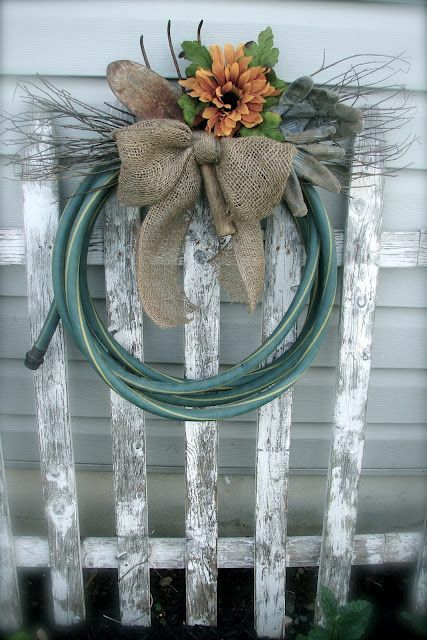 Carla from Cosmo Girls Emporium used an old hose and turned it into an outdoor flower wreath. 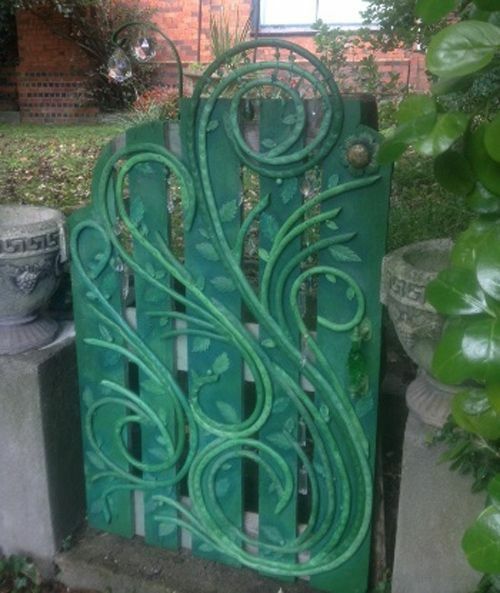 Use a hose and some artificial leaves and add some whimsy to your front gate. From HGTV comes a great idea for all of us veggie gardeners. 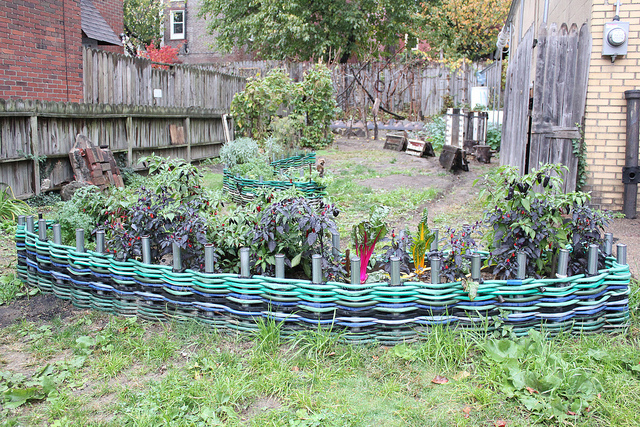 Kara from Kara Paslay Designs shared this photo on her blog showing how the Mattress Factory used hoses to create a little fence around their vegetable garden. I don't now that anyone who would have enough different coloured hoses to do this, but what a great way to brighten up the wall of a shed or garage. And lastly, it might get a bit hot to sit on if left out in the sun, but I think a hose chair could be very comfortable. Disclaimer: I try to give credit to the owners of all the images I use, sometimes this is not possible, those images where the source is unknown will be assumed to be in the public domain. If you are the owner of any of these images (source unknown) and would like them removed or credit added, please let me know. Hello, and welcome to this month's Garden Share Collective, the theme this month is SEEDS. Seeds, they are natures little power houses. Enclosed within each seed case is all that is needed for a new life to begin, from the tallest of trees to the tiniest of flowering plants it all starts with a seed. The largest plant seed belongs to the Coco de Mer, commonly known as the Sea Coconut, it weighs 18kg (40lbs) and is 30cm (12 inches) in length, when fully mature the palm tree which it grows into will be between 25 - 34 metres tall. At the other end of the scale the seeds of the epiphytic orchid which at 85 micrometres (1/300th an inch) is too small to be seen by the human eye. It's seeds are dispersed and carried on the wind coming to rest in the canopy of the rainforest trees where, over time they will sprout and form new orchids. There's a kind of wonder in growing a plant from seed, you put a dry little capsule in some compost, keep it moist, and in a week or so up pops a tiny sprout that with care in time will provide food for your table. A tiny carrot seedling with its first set of true leaves. I use seeds nearly all the time in my own garden, they are cheap to buy and readily available in stores or online. I am very excited to be trying out some new varieties this season. 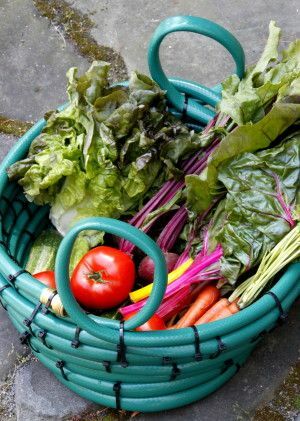 Once you start growing your own vegetables a good habit to get into is letting one of each of your favourite variety of plant go to seed, this way you won't need to buy seed the following season and you'll save money. Sunflower seeds collected from the only sunflower I managed to grow this year, but one is all I needed, I now have enough seeds for sowing next year. I've never seen so many flower buds on a lettuce before. These will eventually provide me with enough seeds for the next few years. I would love to have picked this sprout of the Italian Sprouting broccoli, but I will let it flower and when it sets seed I will harvest them and keep them for next winter. Growing from seed is not always the easiest of options, but it is the most rewarding. There is a great sense of personal satisfaction in knowing that you have been involved right from sowing to eating. So why not give growing from seed a go, you still have time to go out and buy some seeds and get sowing. That's it for this month's Garden Share Collective, if you would like to see what's been happening in other people's garden pop over and visit our GSC hosts Kyrstie at A Fresh Legacy or Kate from Rosehips and Rhubarb. I will see you again for next month's Garden Share Collective where the topic will be PHILOSOPHY. That is going to take some thinking about. I seemed to lose my blogging mojo last week, so this week you get two weeks of gardening in one post. I harvested three cauliflowers and five heads of broccoli today. I let two of the cauliflower go too long waiting for them to get bigger and then I remembered that they are actually mini cauliflowers, I won't be making that mistake again. There are now flowers on both plum trees. They always flower a couple of weeks apart, a fact that I seem to forget every year. Lots of seed sowing today, Rosa Bianca and Snowy eggplant, Hungarian Yellow Wax and Californian Wonder Bell capsicum, Honeybee, San Marzano and Rouge De Marmande tomatoes, Lyon Prizetaker leek, bunching shallots (my first time growing both of these), coriander, thyme and another sowing of spinach. I also sowed marigolds, zinnias, bergamot, two types of sunflower, alyssum and a bee and butterfly mix. Sunny and blustery today. It's the same every year, as soon as the fruit trees blossom it gets windy, hopefully there will still be some flowers left on the trees. My seed order arrived today. Some new varieties to try out. I harvested three more cauliflowers and four more heads of broccoli today as well as a few side shoots and the first of the Early Crop Massey peas. I won't bother with mini cauliflowers again, they take up just as much room as a normal one, but you need three of them to get the same amount of cauliflower. I think both the cauliflower and the broccoli will be finished next week and it will be time to sow the chickpea and bean seeds. After three applications of the milk/water solution the eggplant is looking much healthier with no signs of powdery mildew at all. I bought six crowns of Torrey strawberries at Aldi today, I've never heard of them, but according to the packet they are easy to grow, produce an abundance of tasty, large to medium sized fruits. I hope they do. I spent some time in the garden today as it was too nice of a day to stay indoors. I potted on the two Rouge De Marmande tomato seedlings that I overwintered in the greenhouse, they were looking a bit worse for wear, but hopefully they will pick up now they have more room to grow. Planted out some more Calendula seedlings and some carnations grown from cuttings taken from a bunch I bought at Aldi. The two borage seedlings I planted last week are not looking too good and I don't hold out much hope for their survival, time to sow some more seed I think. I also sowed some seed of Golden and Red Globe beetroot. Golden on the right and Red Globe on the right. So there you go, two weeks in the garden and although there is a lot happening there is also a lot of waiting happening too. All the pea vines are flowering, and I'm waiting for the pods to develop, the garlic is growing well, but I have to wait until at least November to harvest it, and I'm also waiting for seeds to turn into seedlings so they can be planted out into the spring garden. There may not be a post about the garden next week with all the waiting going, but I guess I'll just have to wait and see. There will be another post on Monday though for this month's Garden Share Collective, the theme this month appropriately is seeds. I hope to see you then. It has been a slow week in the garden this week, with very little happening at all. I went down to water and check on the "Baby" broccoli that I had planted last week only to discover that something had eaten every single one of them. I wonder what the chances are that they will regrow. I spotted the first pea pod on the Purple Podded pea vine, such a beautiful colour! I only wish the peas were purple instead of green. And I just cannot get enough of their flowers, they are so pretty. Three of the cauliflower are now big enough to see without having to look for them. After this photo was taken I clipped the leaves over the top of the cauliflowers with pegs to stop the sun turning them yellow. One of the asparagus has decided it's spring already and has started to send up shoots. Hopefully the rest will wait until it's the right time to grow. I harvested the first head of the "Green Dragon" broccoli and one stem of the "Italian Sprouting" broccoli today. I'm really pleased with how the broccoli has gone this year, a big improvement on last year. Both of the orange tree are covered in flower buds despite the fact that one still has fruit on it. Is this normal? Not really gardening, but still garden related, I spent some time today going through all the seed packets I have (a lot more than I realised), sorting them month by month, tossing out the out of date ones, and writing a list of the ones that I need to buy. I then placed an order at Eden Seeds for Golden beetroot, True Gold corn, Turkish Turban pumpkin, Brown Berry, Principe Borghese, Pineapple and Tigerella tomatoes, Purple Beauty capsicum, and Gold Arch Crookneck zucchini. Hopefully with the seeds I all ready have, this should be enough to keep us supplied with vegetables over the spring/summer period. and noticed that the plum tree has burst into bloom. I paid a visit to Cheap as Chips to pick up some stakes and twine that I will be using to help to support the broad beans when they get bigger. I ended up walking out with not only the stakes and twine, but also some seedling trays, seed raising mix, celery seeds, Harlequin carrot seeds and some Giant Dahlia zinnia seeds. I really don't need any more seeds at this point, but I'm sure that a few more will sneak in when I'm not looking. I think it can be quite addictive, everything always looks so good on the front of the packet. I put the eggplant out in the sun today, in the hope that it will help with the powdery mildew issue and as I was checking it over I found six more fruit which brings the total to ten now, and it is covered in flowers. If they all produce fruit I have no idea what I'm going to do with them. A nice problem to have though. So that was this week in the garden and now that I look at the photos I can see that a lot has actually happened in the garden this week, I just haven't had to do any of the work. What's been happening in your garden this week? I apologise for getting this post up two days late, but life has a funny way of changing our plans sometimes. Another week in the garden and the start of a brand new month. It is just seven short weeks until the spring equinox, which marks the true start of spring. I am no where near ready for winter to be over, I love the cold and the rain and I am all ready dreading the heat that I'll have to endure in the months ahead. The first head of broccoli is almost ready to harvest, the others won't be ready for at least another two weeks, while it isn't as big as some I have grown in the past, it is a decent size and I am more than happy with it. There are buds forming on one of the plum trees, I will need to get both of them transplanted into bigger pots this weekend. Satsuma or Santa Rosa? I can't remember. The wombok cabbage that had been attacked by earwigs earlier in the season had started to recover and was looking very healthy, but now something has had a good old munch on it and there isn't much left. I won't bother trying to grow womboks anymore, they are too high maintenance for me. The Topweight carrots and Mendania spinach seeds have started to sprout, and I found two more fruit on the eggplant. It has a mild case of powdery mildew which I will be treating it with a mixture of milk and water. I found two more White Cabbage butterfly caterpillars on the same Curly Kale plant, it looks like I will need to invest in some enviromesh before next year. I dropped into Bunnings on the way home from work today as I needed to buy some compost so that I can pot up the plum trees tomorrow. I ended up buying ten 25 litre bags, I hope it's enough. I also bought two new pots for the plum trees, one packet Panorama mixed Bergamot seeds and one packet of Bee and Butterfly flower mix for the insect garden. I spent today outside as it was such a nice day, as much as I love the rain, it's nice to have a sunny day every now and then. I planted fourteen "Baby" broccoli plants, no sooner did I get the last one in the ground and the White Cabbage butterflies started showing up. I found another of their caterpillars on the Curly kale plant, poor thing it will be lucky to survive, hopefully that was the last one. I potted the Satsuma and Santa Rosa plum trees up into bigger pots, I just wish I could remember which one was which, but the tags disappeared a long time ago. Before I potted them up I drilled holes in a piece of PVC pipe and put a piece into each pot, my hope is that by keeping the pipe full of water it will become almost like a self-watering pot and save me from having to water everyday during summer. Looks like I got it re-potted just in time. I did the same to the mandarin and one of the orange trees. I had to leave the other orange tree as it has fruit on it. I sprayed the eggplant with a combination of full fat milk and water at a 1:25 ratio, I will spray again in ten days time, hopefully that will be enough to get rid of the powdery mildew. I found another fruit on the plant today, that brings the total to four. Not bad for a summer growing plant. I totally overestimated how much compost I would need to repot two plum trees. Not only did I re-pot the plums, I did five chilli plants, a blackcurrant, a raspberry and a blackberry, topped up the potatoes and there is still one bag left. It was a lot of hard work, but hopefully not something that will be needed to be done again for a few years. I placed a small soft drink bottle in each pot when I repotted the chilli plants, each one has a flip top lid to keep dirt and other debris from blocking the water flow. That's it for this weeks gardening update, I will update again next week and hopefully it won't be two days late. So, tell me what has been happening in your garden this week? There hasn't been a lot to do in the garden of late, this time of the year the garden pretty much looks after itself, providing of course there is enough rain and this winter there has been plenty. I started a garden journal a few months ago to help me keep track of what happens in the garden, what chores need to be done, when I fertilised, pruning etc. It has taken me a while to find what works best for me and that is just making daily notes, even if it's just to note the temperature and how much it rained that day. It will be good to have a record to look back on next year. This post is a bit of a catch up post as I didn't do one last week. It isn't a day by day as I don't want to bore you with the weather report for every day over the last two weeks. I fertilised the broccoli, cauliflower, turnips, kale and garlic. The first peas appeared on the Dwarf Blue Bantam. The lettuce and pak choi seeds have sprouted. The first pea pods have developed on the Early Crop Massey. 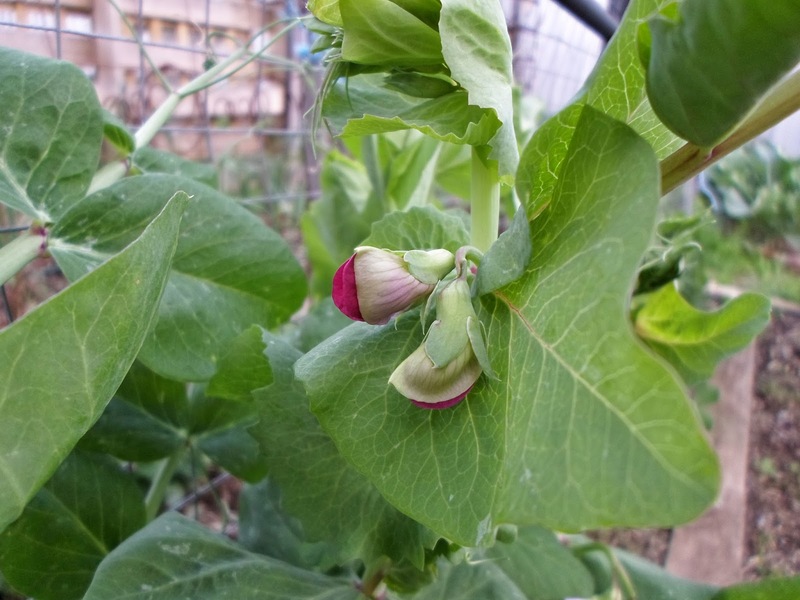 I spotted the first flowers on the Purple Podded peas, only two flowers, but lots of buds. The flowers are lovely. The Nantes carrot seeds sprouted today. The Chantenay carrot seeds and broad bean seeds have sprouted, I am especially excited about the broad beans as this is my first time growing them. I was extremely happy to find today that the cauliflowers have formed heads, some are further along than others which is fine because I really don't need 13 cauliflower all being ready at the same time. A caterpillar has grown fat munching on the leaves of one of the cauliflowers, there is only one so I'm not going to worry about it. I found six caterpillars of the White Cabbage butterfly today, most of which were on one tiny Curly Kale plant. I can't believe that it is the end of July and I am still finding these little buggers on my brassicas. Next year I think I will leave the nets on as they have done quite a lot of damage to my plants this winter. And that brings us to the end of July, can you believe how quickly this year is flying by. I've only just begun to really enjoy winter and it will be over in just a few weeks. I will be back next Monday with another garden update, see you then.